Complete description MICR E13B Match™ font set, MICR Calibration Wizard™, and SecureAmounts™ secure number fonts, V3.00. The MICR E13B Match™ font set and MICR Calibration Wizard™ are the most complete, precise and accomplished tools to produce reliable and anti-fraud checks directly from your PC and laser printer. This package contains fifteen (15) versions of the MICR E13 B Match™ fonts, corresponding to the largest variety of printers and configurations, as well as typesetting and printing equipment. This high precision MICR font set is completed by fourteen (14) exclusive anti-fraud SecureAmounts™ secure number fonts. MICR E13B Match™ font set, MICR Calibration Wizard™, and SecureAmounts™ anti-fraud secure number fonts, V3.00. The MICR techology has been invented around the mid-fifties to help processing the growing number of checks that took much too long to handle by hand. 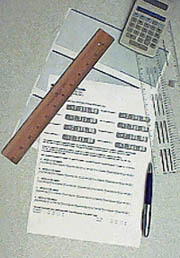 At the same time, tape recorders became commonplace, and micr technology basically uses the same technology : the bottom of checks is scanned by multiple tracks magnetic heads close to those used in tape recorders, and through the special design of MICR characters, a unique electronic signal is generated by each digit or symbol. Magnetic readers are used to process very rapidly and accurately checks automatically, and to help settle amounts as fast as possible. This is the reason why magnetic ink is necessary to print MICR data. Regular ink could not generate any valid signal : regular laser printer toner contains mostly graphite and plastic, both non-magnetic. Inkjet ink contains mostly water, or another solvant, transporting small particles of non-magnetic colorant. The MICR standard has been developped by a group of scientists and engineers from the Stanford Univesity, and the American Bankers Association (ABA). Today, U.S. banks require MICR fonts to be compliant with the ANSI standard. Other countries use the same standard, such as Australia, Canada, Columbia, Japan, the United Kingdom and Japan. Some variations, and soemtimes more exacting requirement, are required by these countries. For instance, Canada requires much more accurate printing. The MICR E13B Match fonts comply to these strict requirements, and is used by major Canadian companies. The have been succesfully tested with the exacting gages from the Canadian Clearwave Electronics. An validated by electronic measurement of the signal. The MICR E13B characters must have very precise dimensions, to generate reliable signal when going through the readers. Many MICR fonts around do not meet these standards, and not all MICR fonts are created equal. Some have positioning inaccuracies that create unreliable MICR strips, and may generate errors in the bank processing equipment, leading to manual processing fees. The MICR E13B Match™ font set has been created with extremely accurate positioning, and tested with the finest benchmark systems. Under ideal conditions, there should be only one font in use, the MICR E13B Match, which has been created specifically to meet the ANSI and ABA (X9, 27-1995) banking standards when printed at exactly point size 12. Unfortunately, the PC printing chain is such, that several weak links can hinder results. Even the most precise of font data is translated at least twice along the printed chain : first, by the Windows printer driver, which converts the font outlines it into data instructions (PostScript or PCL) usable by the printer, and secondly, by the printer internal logic circuits, which translates the outlines in data that will drive the actual printing hardware. Even, at that last stage, outlines are not printed as simple lines, but as a very fine matrix of dots, by a laser beam, LED, or another technology. So a full set of fonts is provided, with dimensions 1% apart from each other. Two smaller sizes (MICRE13 M1 and MICRE13 M2) provide 1% and 2% smaller printing, respectively. Two bigger sizes (MICRE13 P1 and MICRE13 P2) provide 1% and 2% larger printing, respectively. The MICR Calibration Wizard™ will let you easily choose the best font for your entire printing chain, hardware and software. The MICR E13B Match™ font set is the only one that comes with the exclusive new MICR E13B Calibration Wizard™. Within minutes, using this astute calibration tool for all versions of Windows, from 3.1 up to the latest XP, you will be able to generate accurate and reliable MICR strips. Simply launch the MICR Calibration Wizard™ from the Start menu, and follow the simple instructions on the screen. When finished, the program will give you the exact name of the font that must be used to obtain optimum results. Changes in the hardware (printer, controller) and software (Windows version, driver) configuration may modify the MICR printing. With the MICR Calibration Wizard™, you will be able to recalibrate your system anytime you upgrade. In a few minutes, the MICR Calibration Wizard™ will give you with certainty the exact MICR font to use amongst the 15 fonts supplied in the pack. For non-Windows systems, such as Linux and others, manual calibration is provided,. Manual calibration maybe necessary for printers, when printing equipment goes through a different chain than regular drivers (RIP). Print the following MICR strips on the printer you plan to use. Optimum results are obtained with recent laser printers (ideally, 600 dpi, although 300 dpi may suffice) loaded with MICR toner. Or by professional printing equipment using magnetic ink. Temperature and humidity changes paper physical characteristics. In short, paper tends to contract when it dries, and enlarge when heated. Going through a laser printer, for instance, a sheet of paper will be heated by the ink cooking plate, loose humidity in the process, and gain temperature. So it is important after printing to let the paper rest for a minute or two, time for it to regain stable dimensions. When this is done, measure the strips above, and select the one that is closest to 6 inches. In general, it will be MICR E13 B Match, but depending on your hardware and software printing chain, it maybe another one. Sometimes, 300 dpi printers may generate confusing results ; because the signal is interpreted by the printer imager to create a matrix of printed dots, the minute 1% differences between MICR fonts do not show, and for instance, MICRE13B M1 and MICR E13B Match will print identically. This is actually a case of quantum leap : a 300 dpi printer simply cannot reproduce so subtle differences between fonts, and it will increment size in a less precise manner, pretty much the way it happens on low resolution screens. In such cases, the most appropriate font is the one closest to the dimensional jump. Some applications also manage fonts more precisely than others. For instance, Microsoft Word™ does a much better job than WordPad™ (the later usually does not show much difference in size on the screen). This is yet another link in the printing chain, which may change the output. Most recent systems and applications, as well as screen rendition, show a definite difference between each MICR E13B font. In general, best results are obtained with the regular fonts. However, when used with typesetting equipment, typefaces may not always render as bold as when used with laser printers. Some other processes may do the opposite, and tend to bolden printed result. In such cases, the generated signal may not be adequate. For that reason, we are providing two additional series of fonts. Professional printers will appreciate these supplemental typefaces, better suited for their work. How do I create checks ? This package contains a Word template document which shows how simple it is to create checks from any standard application. Special check stock is not even mandatory, as we provide special secure, fraud-resistant SecureAmounts™ fonts that cannot be easily washed, rubbed or counterfeited. You can also use your favorite Desktop Publishing or layout program, and add pictures and logos. Numbers, which contain routing, bank account, check number. Check number can often be generated automatically using the Page Number feature present in most programs. Each separator has a special meaning for the magnetic or optical reader, just like quotes, brackets and parenthesis would have for a human eye. The data between two of these symbols indicates the institution which the check is drawn from. The name says it all. What is between these separators is the amount of the check. This is usually used internally by banks upon processing, and this field should not be used by customers upon normal circumstances. This symbol tells the reader that the following digits represent the account number and other important information. This is sometimes used to separate items in the account number and routing information. Some banks replace it by a simple space. Numbers (digits) have the same meaning as usual, occupy their normal place in the ASCII table, and can be typed directly from the keyboard. Basically, all you have to do to print a valid check, is to copy the data from a pre-printed check, and eventually, change the check number. Because each bank has a specific way of treating MICR encoding, it is usually a good idea not to change the order of the fields, or to add new fields. For instance, the Amount field, which usually is placed on the right of the strip, is often added by the bank during processing. It is very important to make sure that MICR strips are printed correctly, and at the proper place, so bank processing equipment will have no trouble reading it. The structure of the MICR line is standardized. Fields are read from right to left in this order : 1- Amount, 2-On-Us, 3-Transit. Sometimes, commercial checks will have an auxiliary On-Us field. Some extra information used for processing may sometimes be present between Transit and auxiliary On-Us. Normally, the Amount field should not be printed by the customer. The ANSI standards require that all characters of the MICR line fit in a clear band at the bottom of the check, free of any magnetic material. The clear space must be at least 5/8 of an inch, and æ is usually preferable. To print MICR strips, high resolution laser printer and MICR toner are strongly recommended. Professional printing of MICR strips can also be performed with these fonts, with the appropriate magnetic ink. Regular ink should not be used, as it would probably fail the OCR readers for lack of density, and definitely fail magnetic readers. MICR toner can be found for instance at Sensible Solutions 888-852-4325 sales@sensible-solutions.com. Important : Some vendors pretend that MICR strips can be printed with regular inkjet printers. The Federal Reserve Board legally requires magnetic ink. For any serious MICR output, laser printer with MICR toner, or magnetic ink for printing, are mandatory. We decline all responsibility, if any other toner, ink and technology, is used. Even if it may work for a few checks, it will not comply with banking standards. In addition to the MICR fonts, we supply an exclusive collection of 14 secure number fonts called SecureAmounts™. Each of them uses the best technology available, to defeat washing, grating, rubbing, and modification of amounts printed on a check. Like the latest US dollar bills, for instance, the SecureAmounts™ 1-6 fonts use waves of fine-line printing, extremely difficult to modify or counterfeit. This is an exclusive feature of this MICR font set. These fonts support several useful monetary symbols, such as dollars, cents, pound sterling, yen, and euro. The euro symbol is supported in the normal fashion, and accessible through the usual keyboard combinations as defined by Microsoft. Some tiny lines on the samples printed below will only show correctly on printers with a resolution 600dpi or higher. You may want to use a magnifying glass to see small details in these finely crafted, exclusive typefaces when they are printed. As you can see on these enlarged samples, the fine line printing is not using straight lines (fairly easy to modify), but waves of parallel curves. These three examples also show the value microprinting. Straight lines background fonts are provided too, for systems that may not be able to render well the fine line and microprinting of fonts 1-6. Please notice the presence of 'subscript zero' and 'upperscript zero' available through the letters O and o, convenient to indicate cents. This is an exclusivity. Also, monetary symbols are available without the special anti-fraud background, under easy to remember letters, such as 's' for dollar ($) and 'c' for cent (¢). Even numbered fonts bear a microprinting of the number or symbol name under each character. Such minute details may require examination with a magnifying glass. They are also part of the anti-fraud secure features. This the only MICR font set that comes with 15 MICR fonts, with the exclusive MICR Calibration Wizard™, and 14 SecureAmounts™ anti-fraud secure number fonts, in both TrueType and ATM PostScript Type 1 format ! The Windows MICR Calibration Wizard™ (For Windws TrueType fonts, other formats can be calibrated with the help of the enclosed documentation).